Auto back focus has become a more common feature in the past couple of years, with many, if not most, new IP camera offerings containing this capability. Manufacturers claim that auto back focus reduces installation time and makes focusing cameras easier, especially at megapixel resolutions. How do integrators, the ones actually using (or not using) the technology really feel about it, however? As part of our Fall 2011 survey, we aimed to find out. The first, and most commonly cited, reason integrators answered that they preferred ABF was savings on installation and maintenance of cameras. This is most often purely time savings, since the technician sets the camera's field of view, and pushes the auto back focus button. However, rental of lifts for cameras which can't be reached by stepladders is also a factor. "If it's cold outside it's hard to focus a camera without shaking. Wearing gloves and focusing is hard to do. I know thats not the purpose of ABF but it's a handy way of geting the object in focus without wasting time." "Because our client hates calling a technician to focus cameras every bit as much as we hate sending them for that. Every consumer point and shoot in the world can focus itself, and they don't see why a $1000 piece of commercial grade hardware can't." "Auto back focus saves time and provides reliable, consistent results. VERY important when you have to rent a lift to go back and tweak a camera because the tech didn't quite get it crisp enough." "The system does the focusing both better and faster usually." "Big advantage when working alone with a camera that is difficult to access." "We can install the cameras so much faster and the customer can adjust the FOV for their needs when they see fit." "No matter how many times you think the camera is ready, it still needs that little 'tweak'"
The second reason integrators preferred auto back focus was for ease of focusing megapixel cameras. Focusing cameras above standard definition can become difficult. Using composite outputs, which many megapixel cameras are equipped with, it's difficult to adjust fine focus with a handheld monitor, due to its small screen size. Carrying a laptop, which has better resolution and a bigger screen, up a ladder is also a hassle, leading many integrators to use two men to manually focus cameras, which can also be difficult to manage. "With the higher MP cameras the margin for focus error is very small. Significantly weighting this capability for camera specifications and purchases in 2012." "Love auto back focus! Ever try focusing a 5mp mounted 20ft up on a pole? "Anything that speeds the focusing process is a god-send, especially above SD." "During night and while setting up camera, megapixel are impossible to do on a loptop." "This is a must-have especially with how difficult it is to focus a mega-pixel lens." Since focusing megapixel cameras was mentioned numerous times, we expected that those deploying more megapixel than SD cameras would more strongly prefer ABF. However, the percentages between these two groups were nearly identical, which would suggest those deploying SD cameras appreciate the benefits of ABF as much as others. ABF preference increased significantly among those integrators deploying more than 32 cameras per site. Among these integrators, 71% strongly preferred ABF compared to only 39% for integrators typically deploying less than 32 cameras. While any labor savings is beneficial, even on small systems, it stands to reason that those deploying large systems would realize greater benefits than those only installing a handful of cameras at each site. It can also reduce the amount of time rented lifts are required on site, resulting in further savings. 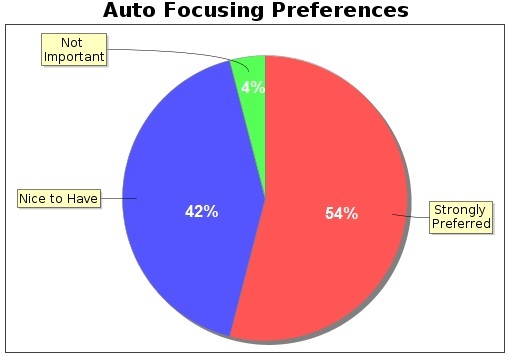 Auto back focus has become a more and more common feature in IP cameras in the past 1-2 years, with manufacturers both major and minor adding it to the new products. Based on this feedback from integrators, we would expect this trend to continue or strengthen, with ABF becoming less of a nice feature to have, and more of a standard feature expected of all new IP cameras.